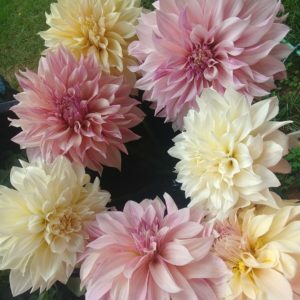 Dahlias that are particularly suited for use as “cut flowers” need to possess certain attributes that may or may not be essential to garden or show quality dahlias. Cut flowers should be vigorous, basally branching, produce many harvestable stems with few side shoots. Good vase life is of utmost importance. They should have good stem length and an ability to be transported without significant bruising. When cut at an immature stage, they should have the ability to develop fully in just water. Of course, color is an important feature of the cut flower as well. Many vouch that color is more important than any other characteristic. For the record, these listed attributes for the ideal cut flower come directly from those who grow and sell cut flowers for a living. 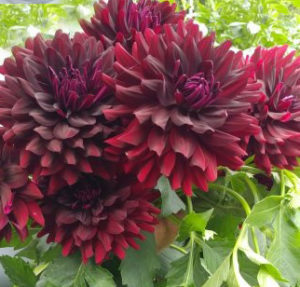 Obviously, dahlia growers can be less rigid in their demands of this flower if they grow dahlias solely for their own enjoyment. 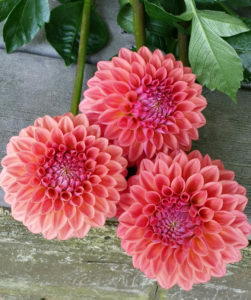 However, with the ideal cutting dahlia in mind, we offer a list of a few varieties that meet these requirements and are readily available from dahlia suppliers. Some current cut flower favorites include Cafe au Lait (brides love these! ), Hollyhill Black Beauty, Crazy for Don, and Brookside Snowball.